Researching different haunted places in Connecticut, there is one place that keeps coming up, time and time again. It doesn’t seem like much, but Guntown cemetery has the reputation of being one of Connecticut most haunted places. 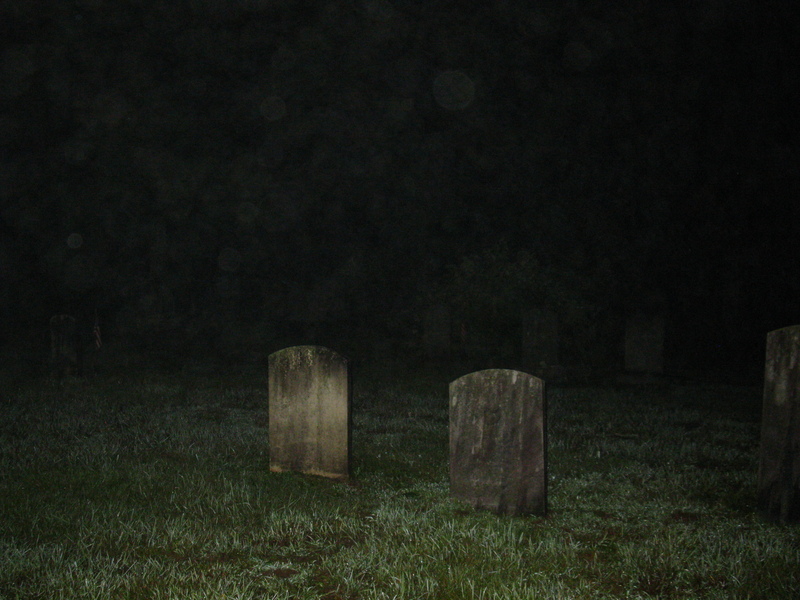 Looking at it you wouldn’t be able to tell, it’s a small cemetery in the middle of a small country road, and behind its stones, a large open field with large grassy hills in the distance. Calm looking at first glance, but don’t let it fool you. When you read about ghosts in Connecticut, for some reason or another one thing seems apparent, Connecticut’s Lower Naugatuck Valley area is flowing with paranormal activity. One of the main reasons why one might think this is because of the work of two of Connecticut first paranormal investigator’s Ed & Lorraine Warren. Being that they were from the town of nearby Monroe, most of the Warren's work was done in their local area. Whatever you might think of the Warrens, you cannot deny their contribution in getting some of these areas in the Naugatuck Valley put on today’s haunted place websites. When looking for haunted places to go to online, towns like Monroe, Derby, Easton, Naugatuck, Ansonia, and Seymour just pop up right on your screen. One could argue that the Lower Naugatuck Valley could be the most haunted area in the state. Another good reason why this area is booming in supernatural activity, it’s history. This history dates back to 1642 with the town of Derby, then later on with the area of Naugatuck becoming settled in 1701. However that’s just from early European record, who knows what took place here before, with this land being popular with the local Indians for quite some time before. Someone once brought it up to me my article on Farmington CT and the fact that Farmington was the 5th town incorporated in Connecticut. I was told that this was wrong because Derby was established 3 years before Farmington. Now it maybe so that Derby came 3 years before Farmington, however what most people don’t know, back in Connecticut’s beginnings, Connecticut wasn’t the land area as we know of today. 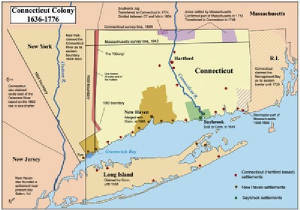 In its beginning the area we now know as Connecticut had 3 major separate colonies. They were: The Connecticut colony, The New Haven colony, and the Saybrook colony. With that said, looking at maps of early days, that statement is true, because Derby was a part of the New Haven colony, not the Connecticut colony. These two colonies were separate until their merger in 1665. Now known as the Lower Naugatuck River Valley, from 1638 to 1655 this area was known as The New Haven Coloney. Its Northern most border, stretched from the modern-day towns of Naugatuck to Meriden. Its eastern border went from Meriden to New Haven, and it’s western from Naugatuck to Bridgeport. To the south of course was Long Island Sound. Although not connected the New Haven colony also held a small area of land in the area of Stamford and Greenwich. One interesting find is that its western border going to Bridgeport goes along what is now Route 8. Perhaps this is how Route 8 found its way. At any rate, being the fact that this was the New Haven colony, this does explain why these towns look a lot older than a lot of other town’s in Connecticut. Who are the Gunn’s? The history of the Gunn family is not hard to find. Going way back even before the colony of Connecticut. The first to arrive to Connecticut was Scottish born Jasper Gunn (1606-1670). His first journey was from London to Boston on October 8, 1635. He and his wife then made their way to Roxbury CT. Looking to start his own small colony, Jasper with several other families from Roxbury and Dorchester purchased even more land from the local Indians. Then on November 24, 1640 this area was named the town of Milford. Being considered one of the founders of Milford, Jasper Gunn was also considered to be Milford first physician. After living in Milford for awhile, he and his family moved around Connecticut a few times, in 1647 they moved to Harford. Along with being a Doctor Jasper Gunn did many other things. He was also a deacon at the church in Milford, a lawyer (For a few cases), and sealer of weights and measures. With all his life experience, he was made the main operator at Hartford’s Mill from 1649 to 1658. At his death in 1670 he and his wife Christian had seven Children. His decedents have since spread threw out Connecticut, including Naugatuck. The area what was once called Guntown is an 800 acre area located just off of Naugatuck’s Rubber Ave Ext. The Gunn family was said to have lived and operated a sawmill in this area sometime around the 1740’s. The Guntown cemetery lies somewhat in the middle of what this land area was, with many people buried their bearing the same name. Obviously this was the spot to where the Gunn family started burring their deceased family members, while other family soon followed suit. Guntown cemetery is a small cemetery with a huge reputation. Even though it’s a very well known haunted area, its past really has no story to tell. Almost all haunted spots have a story to them. There is almost always a story of murder, illness, or some other misfortune attached to a spot as notorious as this place, but that is not the case with Guntown. Even if a story cannot be found in its history, someone, somewhere down the line will usually conger one up to make such a place more interesting. Most people will agree however, no such stories; real or fabricated does exist, despite the presence of ghosts. In short, no one really knows why Guntown would be haunted, or why it has the reputation that it does. I did learn one thing though, in my talks with many other paranormal groups, Guntown is a place where even the most skeptical ghost hunter could potentially change their mind. If you want to find evidence of a ghost, this is a great place to look; it almost never lets you down. My field investigation took place on July 31, 2009, a very nice summer night. The weather warm with clear skies. I arrived there shortly before midnight, minutes before we switched to the month of August. When we parked the car on Guntown Rd. 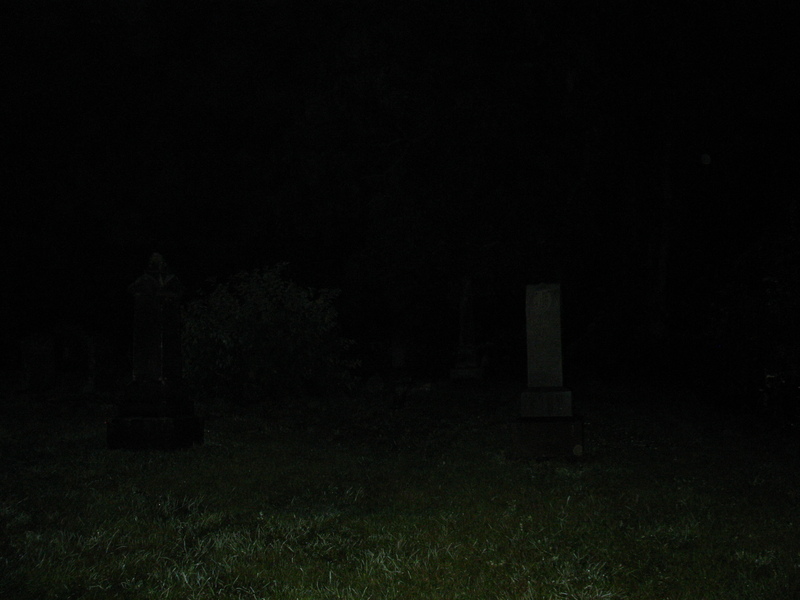 and got out, I couldn’t help but notice how dark and quite it was, and I didn’t realize on how big of an open area surrounded the cemetery, this drove my curiosity more. As always, we proceeded as we normally do with a field investigation, by taking pictures, and recording audio for possible EVP. While we were conducting our investigation, I didn’t really get any overall negative feelings, such as getting scarred or freaked out. I didn’t feel like I was being watched like in as in other investigations, what I did feel was a very intense curiosity toward the place, as if I had something to learn from Guntown, or Guntown had something to say. While the other group members were taking pictures, I did the job of asking questions and recording with two different digital recorders. The questioned I asked were the same type of questions that I usually ask during any paranormal investigation. Questions I refer to as my “Standard Questions” examples of these questions would be something like “What is your name?” “How long have you been here?” “Do you like us being here?” “Do you have a message for someone?” etc……. I do however, put a good deal of emphasis into audio EVP’s depending on what comes out. It seems, for some reason, I have better luck at capturing potential EVP’s for some reason. I’ve gotten pretty good at listening to and evaluating audio. Ruling out normal background noise and picking up on unexplained phenomena. The audio I gathered at Guntown provides some of the most unexplained audio yet. This is what keeps ghosthunters going out. Now maybe someone can explain this audio to me, maybe it has a rational explanation to it, but it’s truly amazing stuff that have me the chills when I first heard it. Gunshot on first recorder "BANG"
The response on the second recorder on the same question I got was totally different. Instead of hearing “BANG!” like the sound of a life like gun, you hear what sounds like a man’s voice go “KA-BANG” just as spoken words. While listening two the second recording you can tell that it was recorded by a different digital recorder because my voice sounds a little clearer. In conclusion of the whole investigation, I would say that Guntown doesn’t really have too much of a known story to it. Perhaps it did at one time and it was just lost over the years and people forgot what it was. However if you want to capture evidence of a ghost in Connecticut, this would be a great place to look. Most people I know have gotten something unexplainable from this place, Make sure you bring more than one digital recorder, and always listen to both, you never know what you will hear…..